Spending time outdoors is the key to happier, healthier and more confident children, however, only 1 in 5 of them regularly play outside*, says leading youth charity YHA (England and Wales). The charity says that the opportunity to have adventures in the outdoors is vitally important to developing young people’s confidence, resilience and ambition for the future. Studies also show that just 5 minutes of ‘green exercise’ can improve a child’s mental wellbeing**. To help more young people benefit from the transformational power of travel and adventure, YHA has launched a brand new campaign - The Adventure Effect. It hopes the new campaign will inspire young people and their families to get outdoors. If we want to raise children to be healthy physically, mentally, socially and emotionally, we must look at the experiences they’re having during childhood. Outside, spontaneous experiences in nature are critical to their development. Highlighting the impact of people not having the opportunity to access travel and the outdoors, YHA confined the professional adventurer and author Alastair Humphreys to a room for three days. In contrast, the film also follows five young people during their first trip to the Lake District and demonstrates their personal transformation during that time. Launched on Wednesday 7 November on social media, the film charts Alastair’s increasing frustration and unhappiness at having the opportunity for adventure removed from him. On day two of the experiment he admits to ‘feeling low’. I am delighted to support YHA’s Adventure Effect campaign. Being inside the room was a big learning experience for me. Three days seems like nothing but when the ability to go outside whenever you want, and the mental stimulation that goes with it, is taken away from you it is a huge shock. I was really surprised to discover I use my phone too much and use it to fill in any quieter times during the day. I also realised that I take my ability to have adventures – big and small, for granted. 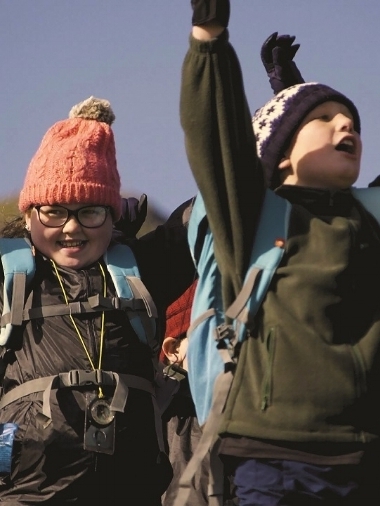 YHA has 150 locations throughout the UK offering affordable access to adventure for everyone, regardless of age. Youth hostels are located in National Parks, coastal resorts, towns, cities and rural areas of England and Wales. YHA has been around for nearly 90 years providing travel and adventure for young people. While times have changed, the transformative effect of adventure is as relevant today as it was in the 1930s. Don’t just talk about it. Do it. Do something simple and small, like going for a walk in your local woods or head up a hill. Make sure you’re warm and prepared for bad weather with suitable waterproof clothing. Take friends or family with you so you can share the experience and encourage each other. Making the most of the outdoors shouldn’t be about pushing yourself and feeling miserable. Go at your own pace and have fun.